The Home Secretary and Home Office are the bodies which would implement the Henriques recommendations. Therefore we need to ask our MPs to apply pressure on/encourage the Home Office to act by implementing the Henriques report. The request for the MP to act (either by interview or letter) needs to be clear, concise and balanced. We need to have the most important recommendations at hand to support the request and to make the request more 'tangible'. If you cannot see your MP face to face, you can use the the template letter which can be downloaded using the button on the left. However, it is better to write it in your own words. Any letter appearing to be duplicated or obviously ‘cut and pasted’ will not be acceptable. Please can you provide any feedback from your MP to Unfounded's email address on the contact us page. 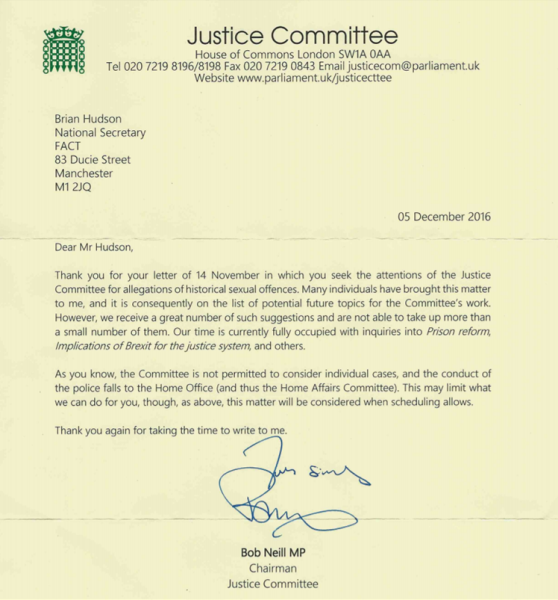 ​​The response from the Chairman of the Justice Committee, Bob Neill MP in October 2016 (left) illustrates that the Justice Committee may be open to an inquiry into historic sexual assault. If you or your family have been impacted by a wrongful allegation of abuse please write to the Justice Committee with your story and request for an inquiry to be considered.